In a upcoming project of mine, I've been playing with a new property in CSS called -webkit-filter that allows you to apply image filters to HTML elements. For testing, I built a simple WebKit CSS Filter Demo page that allows you to experiment with tweaking the filter values. "Quality is Always In Demand"
-- Uttered (or written) by David Turner, responsible for some recent iconic brand designs. There's a new TV channel in Britain called 4seven. The idea is (surprisingly) not 24/7, but that Channel 4 in the UK will re-show the most "talked about" shows in the last seven days. I stumbled across it because of Creative Review's article on their new ident design. I'm always impressed with Channel 4's ident design and this one doesn't disappoint. I wonder whether this TV channel concept will work. I feel like watching TV nowadays is more about live events than reviewing what is popular. Is this applying the CNN/ESPN style repeat-repeat-repeat format to regular TV? Yesterday, Patricia and I went to MoMA. Even after all those visits to New York and after living here for nine months, I still hadn't managed to go until now. 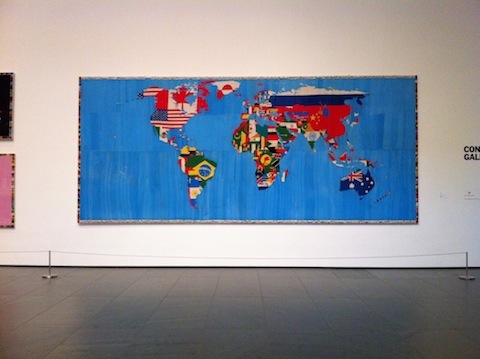 I love the New York MoMA. It's an incredible collection they have and so many things that inspire me here. 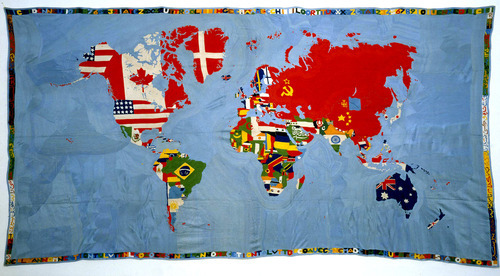 Notice that the Soviet Union and the Russian Federation flag is different. I wonder he managed to make one every year. There were other great pieces in his exhibition though, like the Manifesto (1967) which looked like an infographic before its time. I also like the scale of the Biro drawings where he employed other people to do his bidding but also had an infographic element to it in I Sei Sensi (1974). 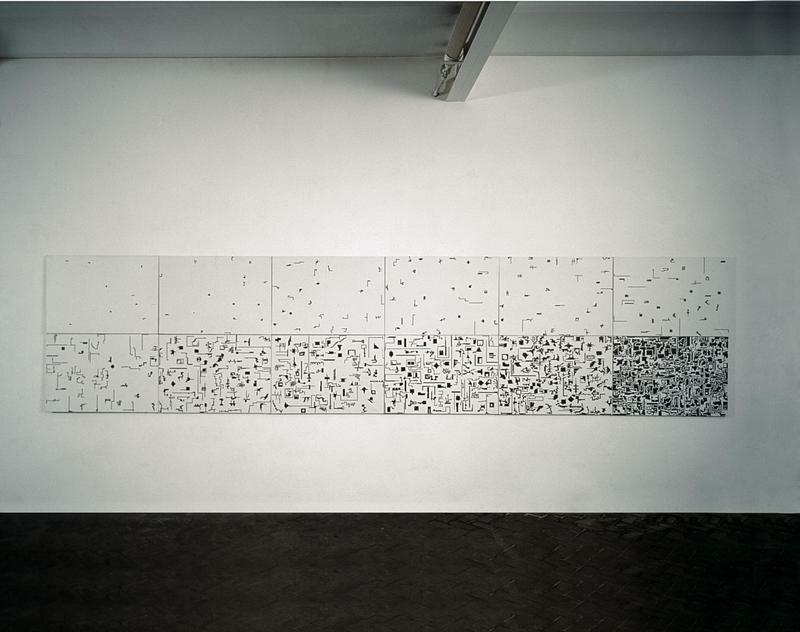 Finally, there's a piece of work that looks like the Game of Life called Storia Naturale Della Moltiplicazione (1975) where it just looks like blobs one multiple pieces of large graph paper. There was a lot more to this exhibition and all the other collections I managed to see at MoMA. Let me try and get around to writing more about the other collections in a later post. Just in case people missed the venus transit, here is the replay of the venus transit, sped up 30x. We ended up not using these exceptions much. The exception we used the most is when entertaining out of town visitors. 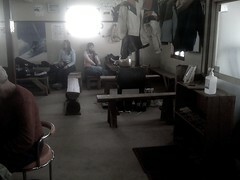 And the rule is there because we don't want to try and mediocre place if visitors are spending precious hours here. The local restaurant exception we've only invoked a few times, mainly for Shake Shack which is less than 4 streets away. Even then, we've only been there two times under that exception. Recently, a delicious food fair opened up very close to our place called Madison Square Eats, and they have some delicious food from notable restaurants that we've been going back to repeatedly (Aracini Bros, Momofuku Milk Bar, Roberta's Pizza). This is a grey area, but they do fall in to both the exception of being local, and mainly take out. The other party not-present repeating exception has also only been invoked when I go to a fabulous place that I want to take Patricia to or vice-versa. I think in recent memory that has only been used two or three times. Even the coffee shop exception has only been invoked once when we recently repeated one of my favourite coffee shops in New York, Everyman Espresso. I find it pretty surprising that we've managed to stick to this rule for about eight months. I'm unsure whether we'll stick to these rules for the next few months, but the spirit of them lives on. There are just so undiscovered things to try in New York, there is no time for dwelling on a favourite. One regret though is that when we stumble across a great place, or a place has a menu that is worth repeating, our rule stops us from revisiting. So I ended up focusing on curating a list of my Repeatable places we would try out again if we stopped following this rule and also a list of my all time Favourite places in New York. Where do I start with New York? It is everything people say it is, plus some more. It has been eight months since I've been here, and wow does time fly. There's so much to say about it, there's so much to show about it. I need write down my impressions. I've been wanting to do that ever since I moved here. But the best I've been able to do is to document it with photos. See my New York 2011 and New York 2012 albums. Whilst I scatter photos in the wind amongst Instagram, G+, Twitter, and by proxy, Facebook, the two albums above are my permanent collection of the amazing things I've seen. Looking through those photographs make me excited and happy. 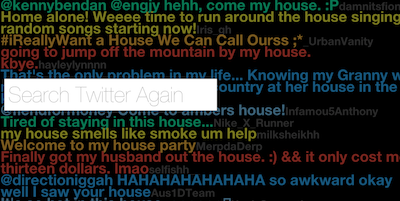 I resurrected some code I had from about two years ago when I would often monitor a stream of small textual data source and repurposed it as a twitter stream viewer. I stopped posting to my blog some time in 2010 (two years ago). It was down to me finding Twitter and Google+ way easier to use as a publishing platform and vehicle for my thoughts. Fast forward to 2012. A lot has changed in the mean time. I moved to New York. I'm more interested in writing some longer form posts that can persist in a more controlled way. So over the last few weeks, I re-wrote my website backend, ported all my posts, pages and projects over from a few of my sites that I hosted on my co-lo servers over to AppEngine and Google Cloud Storage. I also un-designed my website, stripped out everything that was extraneous. I'm not quite done, but I think it more reflects what I want in a web site these days. 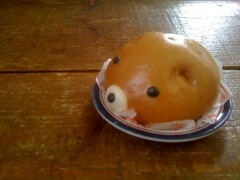 I ate a a lot while I was in Hokkaido. I'm a big fan of seafood, so this was essentially heaven to me. 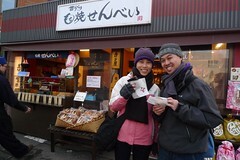 This place was our first stop in Hokkaido after training it for 6 hours from Tokyo. It's a big port town on the southern part of Hokkaido. We arrived on the last train to get there that night (around 10pm). After checking in to our hotel, we tried to seek out the closest seafood bonanza. Unfortunately, it was pretty late by then and most places were shutting, but we did find this one place only two blocks away from where we were staying. It was snowing pretty hard, so we took shelter in a nearby restaurant (函館朝市浜一食堂). We later found out that just around the corner near the side closest to the station in the market was a complex of nice cheap noodle and rice restaurants. But we settled into this cute little place that was inside the market. 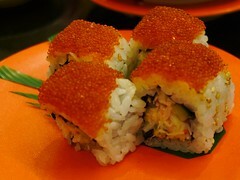 I ordered scallop and salmon roe sashimi rice (ホタテいくら丼). This was as sweet and delicious as it looks. 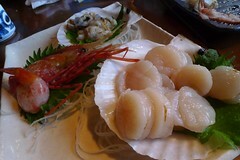 I just love scallop, especially when it is fresh. There were heaps of stalls selling live scallop so I had no doubt that this was pretty fresh. and pp had some ramen with a crab rice. They seemed to be famous for crabs in this part of the world, crab was always an option. We went to this fabulous place called Yo (aka, Hurry Slowly). All I can say was no one got food poisoning. We stopped over in Otaru for a day, a kind of impromptu stop because I planned it at literally the very last minute. I think I found only two hotels on expedia in that area, so I ended up having to use my Japanese skills and Rakuten to book an awesome spa hotel called Otaru Furukawa (street view) right in the middle of town with a open air onsen on the top floor overlooking the town. This hotel has one of the most awesome looking lobbies for a multi-story hotel. 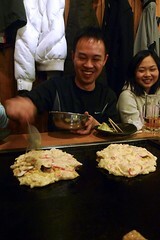 Otaru is one of the other major port towns, and yet again, excellent seafood. As soon as we checked in a dumped our bags we headed for a seafood store right around the corner from our hotel. You had to buy/select what you wanted downstairs in the market and then go upstairs where they prepare it for you for "free". I thought the deal was nearly too good to be true, but it was exactly like that. We chose to get some scallops, octopus, prawns and crab. The crab was cooked, but the others were prepared with half sashimi and half grilled. The portions were so big, we embarrassingly asked the waitress whether she forgot that half was going to be grilled. We watched her go into the kitchen to talk to the chefs and they were laughing, and she came out to confirm that it was indeed only half grilled and this was really only half the food we ordered! 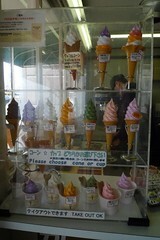 Not long after we had our meal and did our fair share of walking down the road, we stumbled across a soft serve place that was advertising a three flavoured soft serve, which I could only guess was taro, milk and melon. 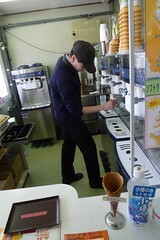 The guy behind the counter was a skilled soft serve machine operator, and the fancy machine was operated by foot. Too bad I didn't take a video, but his style was top notch as you can deduce from this pose. 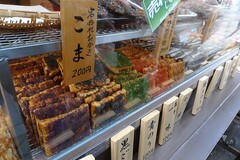 Another short walk and we stumbled into a baked rice cracker store with another set of colorful flavours! We couldn't resist. 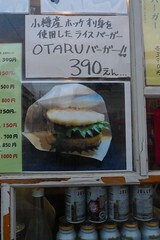 And then not far from there sat a Otaru Burger stand! I was bursting at the seams, really wanted to try it but I just couldn't. So I took a picture to remember this failure by. 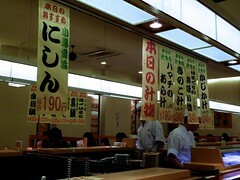 Finally, our last proper meal in Hokkaido was at a kaiten sushi place that I wrote about. I was too busy eating that I didn't take many photos of the food, but here's two to demonstrate. 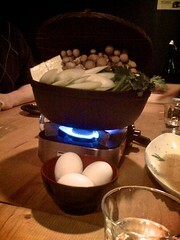 All in all, a really delicious holiday in Hokkaido. And as I said, interspersed with some snow boarding.